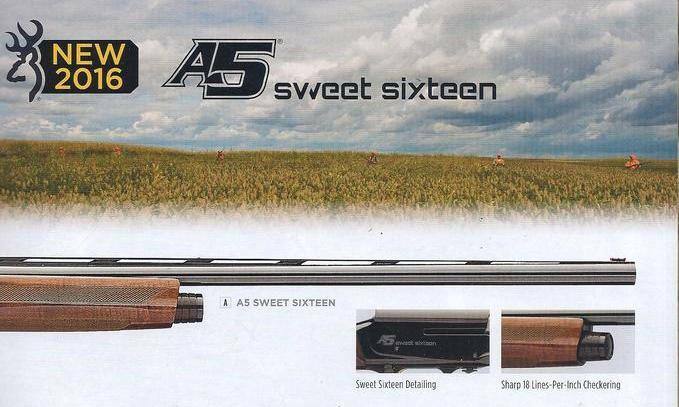 As mentioned previously, the Browning A5 “Sweet Sixteen” is coming back, sort of. It isn't an Auto-5, it is an inertia (kinematic) action as is the “new A5” 12 gauge. But, it is a 16 gauge, has what Browning calls “Double-Seal 3” choke tubes, and is the first new 16 gauge autoloader in who knows how long. According to Browning, availability is said to be May, 2016. Apparently, Browning is not releasing a 20 gauge A5, but is adding only the 16 gauge for the time being. According to Browning, the 26 inch A5 16 gauge weighs 5-3/4 lbs. The tested A5 12 gauge Hunter Model was 6.5 pounds. MSRP is $1699.99. The tested A5 12 gauges were somewhat disappointing: http://www.randywakeman.com/ReviewBrowningA5HunterRoundTwo.htm http://www.randywakeman.com/TheNewBrowningA5AdventurePartIII.htm . Hopefully, Browning will decide to equip their autoloaders with factory triggers that don't have a break weight that exceeds the weight of the entire gun. In the 12 gauge, Browning's “Invector Double Seal” attempt was a disaster. Part of the “Double Seal” idea was and is good: the choke tubes don't loosen and they do stay cleaner than most. Browning apparently lost their mind with constrictions, in 12 gauge, something they fixed with the 20 gauge DS choked guns. With a hunting gun, surely there should be at least one choke tube in the box that you can actually use for hunting? At one time, the Browning Automatic-Five Sweet Sixteen was my most-used hunting gun and I had five of them. Along with an Ithaca M37 16 gauge and a cheap Winchester M24 SxS, that took care of most of my hunting requirements. The main problem, today, has nothing to do with the gauge itself, but with the lack of good ammunition. While the 20 gauge has seen significant advancements in shotshells, the 16 gauge has been ignored. Nevertheless, 1 oz. of hard #7-1/2 shot is an excellent dove load, and 1-1/8 oz. of hard #5 shot is an effective pheasant load, although the buffered 1-1/4 oz. loads are markedly better and notably not commercially available. The 2016 Browning A5 does include a series of firsts: the first “backbored” 16 gauge ever offered, along with the usual Browning Vector Pro forcing cone treatment. While most Browning labeled firearms have no written warranty, the A5 comes with gimmicky 100,000 round or five year guarantee . . . “come hell or high water.” Rather than saving hulls in the basement, I think you're better off thinking five years and not drinking the water. Browning is currently the only mainstream label of shotguns that still offers multiple 16 gauge models. The classic Citori is run in 16 gauge from time to time, the latest being in the Gran Lightning configuration. The BPS 16 gauge was introduced as a “Shot Show Special” in 2007 and has sold well enough to stay in the Browning line-up ever since. With the A5 Sweet Sixteen, Browning looks to capture essentially 100% of the new 16 gauge autoloader market. What that market is, exactly, no one knows. The last attempt at the novelty of a 16 gauge autoloader was a ponderous one: the reintroduction of the Remington 1100 (along with the 870 in 16 gauge). They were both ponderous pigs in the field. I immediately bought a reintroduced 870 Wingmaster with a 28 inch barrel. It was a weighty old warthog, so much so that I had Mike Orlen cut and rebead the barrel, losing the nasty Remchokes in the process, to balance it a bit better. It still weighs 8 lbs., 6 oz. on my Lyman electronic scale. Browning will better their chances if they lose the ridiculous center bead they show in their catalog: something no Sweet Sixteen should ever have, and lose the plastic tubular bead in favor of a traditional silver or gold metal bead as well. An ivory-colored plastic center bead and a red tube at the muzzle goes together like oil and water. Time will tell, but I hope the “Sweet Sixteen” makes it. The new A5 Hunter 12 gauge 26 inch has a Browning website weight of “6 lbs, 15.8 oz.” You can't make this stuff up, for that is what it says. Yes, Browning claims their 26 inch A5 3 inch 12 gauge weighs more than the 28 inch and 30 inch models. Regardless of the sloppy typos, the tested A-5 12 gauges weighed 6-1/2 lbs., lighter than stated. At 5-3/4 lbs., the Sweet Sixteen promises to shed at least three-quarters of a pound off of the 12 gauge models, making it lighter than most 20 gauges out there, and substantially lighter than the Browning Silver Hunter and Winchester SX3 20 gauges. The BPS 16 gauge came in at a chunky 7-1/2 lbs. as tested. The Benelli 24 inch Ultralight 12 gauge as tested weighed 6 lbs., 3 oz. The Browning A5 Sweet Sixteen promises to be what many sixteen gauge aficionados have long claimed they wanted: the lightest 16 gauge autoloader ever made. Note: It didn't come all that soon, but here is part one of the review: http://www.randywakeman.com/REVIEW2016BrowningSweetSixteenPartOne.htm .